There are a lot of articles and financial firms that give varying forms of advice on how much retirement savings you should have at a given age. 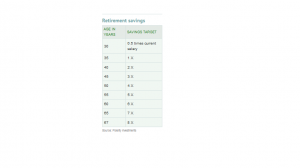 Recently, there was a report put out by Fidelity, a major 401(k) player outlining their advice in the table below. We’ll take a look at their suggestions and then I’ll share some thoughts on why broad cookie-cutter advice may be way off (primarily because their assumptions are wildly unrealistic for most Americans today) and how to appropriately plan for your retirement needs based on your individual circumstances. According to this popular article at MarketWatch, based on your current salary, you should have about 1X salary saved by 35, 2X by 40, 3X by 45 and so on. This may seem like a laudable goal, but some of the assumptions leave something to be desired. First off, they assume you continue saving at the prescribed rate until age 67. Who’s Really Going to Work Until 67? – First off, many Americans actually NEED to work well into their 70s because of the financial situation they’re in. But that doesn’t mean they have the choice to just keep on working their current high-paying job. Someone half their age, overseas, or a robot will be doing it. So, that certainly doesn’t meant that someone who’s 35 years old now working a white collar job for a large multinational is still going to be employed at a similarly compensated position at 67. Let’s get real. My company has virtually nobody left with gray hair. I’ve started to see more and more “early retirements” over the years and there’s virtually nobody over 55 left working there. Many firms are following a similar tactic. The reality is older employees have much higher salaries and statistically, are likely to have higher healthcare costs (cancer, diabetes, heart disease and other extremely costly maladies really start to set in from 50-70). Many companies actually have mandatory retirement ages of say, 65, as well. Right, wrong or indifferent, this is the current business model and it will likely only accelerate in the coming years. Why would you set up a retirement plan based on contributions to your 401(k) with a salary/income that you’re not going to be able to sustain until the assumed 67 years old? Ridiculous Salary and Inflation Assumptions – Here’s another gem. Fidelity bases their assumptions on the notion that “your salary will grow 1.5% a year over and above a general inflation rate of 2.3%”. That is also laughable. Not only will inflation likely be much higher (or surely could be) in future years given how we’re debasing our currency with non-stop spending, but also, who really expects to keep getting 4% + annual raises? First off, as you age, promotional opportunities dry up. When I was in my twenties, I was being promoted every couple years, so I’d get a nice annual raise plus a raise from the promotion. Now? I may have one promotion left in the next decade. I’m already at a level where I’m surrounded by very high performers (lifers/workaholics) and 2 levels above is “executive” where the company pretty much owns you. So, a typical worker in their 40s-50s may only expect routine annual raises. 4%? That’s a pipe dream. The median pay increase in 2012 was just 3%, not the 4% assumed. That’s when we were in “recovery”! hahaha. I’ve come to the conclusion, and perhaps you should to, that your salary may never increase again in terms of present dollars. Flipside – It’s not all bad for everyone. While most of these rough assumptions assume you will also draw Social Security at current levels (another dubious assumption), there is a silver lining for millions of Americans – other income! Some people will have pensions to draw from, while others have set up an alternative income stream like real estate, blogging, or whatever other business you may have set up along the way. Having some income in retirement greatly diminishes the amount you need to have saved along the way. Similarly, what if you have two working spouses but have lived primarily off only 1 income for most of your lives (like in our case, my wife will have been home with the kids for ~12 years and then will return to work to save for college while we continue to live off my salary). That’s another situation where you might have a combined income of say, $150,000 in today’s dollars but only need to focus on 1 salary of say, $100,000 as your baseline. There are many favorable situations that can offset some of the rosy projections above. Putting It all Together – You probably don’t want to hear this but I firmly believe these rough rules of thumb could be so far off what your actual needs are that they do more harm than good. You need to set up your own plan. Whether you seek out a financial advisor or set up a detailed spreadsheet yourself (I did this in under an hour and update it monthly), you need to tailor all your own assumptions. My assumptions differ dramatically from any rule of thumb models covered by Fidelity for numerous reasons (my wife not working now, then income going toward college; my side income, NOT planning to work until 67, etc.). Getting your retirement right takes work. I am less than 5 years away from retirement. I will have no debt when I retire. I am on schedule to pay off my mortgage and car loan in about 4 years. I have my needs more than covered with Social Security and my pension. My IRA, Roth IRA and brokerage account will cover my wants at a 3% withdrawal rate. You’re in an awesome situation Krant! Personal finance has been a life long hobby. I know I should never save “never” – but I never planned to retire at 67. That being said, luckily, I am ahead of the “target” as we have been saving in the 401K equivalent at the max amount and getting matching contributions, dabbled in real estate and have a stream of rental income coming in, and invested outside of our retirement accounts. We have no debt. We are looking at college expenses in about 1.5 years and would love retire – except that we are not “old enough” to start drawing from our pensions or social security. That being said, since I am vested in the pension plan/401K equivalent, I am seriously considering taking advantage of Rule 72T for fun $ and college expenses – until I hit the right age. I think everyone should have a personalized retirement plan too. It’s too general to base the saving on your income. I agree about the retirement age too. My old company only has a few older folks. Most old people got forced out sooner or later. It’s just a fact of life now. You always need to think about the next career and don’t get complacent. 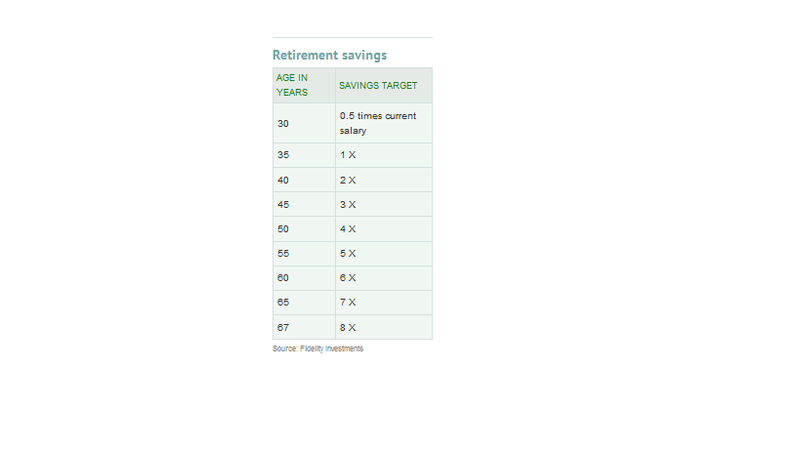 I think people need to start savings more for retirement, and need to personalize their savings strategy. We are definitely planning to save as much as we can while we can. Hah!! 2.5% merit increases as far as the eye can see, if we’re lucky. A cost-to-benefit analysis is long overdue for all those early mornings and late evenings.